The Charlevoix County Commission recently enacted an ordinance authorizing operation of off road vehicles on almost every public road on Beaver Island starting May 1. Adopted pursuant to a state statute passed last year, the new ORV Ordinance permits operation of “ORVs” on “the far right of the maintained portion” of all “county primary roads” and “county local roads” in Charlevoix County, with only a few exceptions. On Beaver Island, the only exception is “Kings Highway, which includes Main Street, from the Light House, Sec. 26, St. James Twp. to East Side Drive, Sec. 34, Peaine Twp.” So it won’t be legal to drive an ORV from the Whiskey Point Light House through town to the Four Corners, but they will be legal on all other county roads on the Island – unless the Township Boards prohibit their operation on some or all of those roads. The Ordinance says a township board “may adopt an ordinance to close any roads within the boundaries of the township to the operation of ORVs permitted by the county.” It also says that starting July 17 a township board “may adopt an ordinance authorizing the operation of ORVs on the maintained portion of 1 or more roads located within the township” pursuant to state statute. We made it clear that we had not surveyed BIA’s total membership on this matter and did not presume to speak for all members. Indeed, it may be said that there was not and still is not unanimity within the BIA Board on this matter. Also, we recognize that much of the ORV use by Beaver Island residents on Island roads has been responsible and respectful of motorists, bikers, pedestrians and the environment. The DNR also recommended that the Charlevoix County Commission not approve an ordinance allowing ORVs on county roads, but neither our opposition nor the DNR’s counted for much with the County Commission, and according to the Charlevoix Courier, mainlanders enthusiastically voiced support for the county ordinance. There also have been strong public statements both in favor of and against ORV operation on Island roads by numerous Beaver Island residents, most recently at a special Peaine Township meeting on May 31. In large part, the argument in opposition has focused on speculation that Beaver Island will become a magnet for irresponsible ORV use by visitors from the mainland, both on Island roads and in other areas (beaches, dunes and other public and private property) where it still is illegal to operate such vehicles. Now that the County Commission has acted and left possible limitation of ORV use on public roads on Beaver Island almost totally up to the Townships, the issue is in the hands of the Township Boards. Whether or not they choose to act is of course up to them, but the BIA Board has reconsidered the issue in light of these new realities and recommended that no Island roads be closed to ORV operation at this time. Our letter to the Peaine Township Board on this subject is included in this newsletter, and to help understand the total context in which this issue has evolved, we also are including the DNR’s November 2008 letter to the County Commission. As stated in our letter, we believe it is important to learn the opinions of as many Beaver Islanders as possible, not just the most fervent supporters or opponents of on-road ORV operation, and to let enough time pass to see whether predicted hordes of irresponsible ORV-riding tourists actually materialize, before any such action is taken. Therefore we would like to hear from all BIA members who have opinions on this subject. Please send them to me by email addressed to paulglendon@gmail.com or by USPS mail to the BIA post office box, and also make your views known directly to Township officials. As our letter also indicates, we encourage everyone on Beaver Island to be vigilant in the observation and reporting of any illegal use of ORVs, on-road or off-road, and we will be working with the Island-stationed Deputy Sheriff to encourage prosecution and thorough reporting of all such illegal activities. We also have prepared an information sheet about ORVs on Beaver Island, to be distributed to ORV-riding visitors and posted at various places on the Island, which also appears in this newsletter. With this pro-active wait-and-see approach, we believe the Township Boards will best be able to understand all the issues surrounding ORV operation on Island roads and perhaps to fashion a reasonable compromise between the extremes of unrestricted permission and outright prohibition. We are confident they will fairly consider all views on this subject that needs to be thoroughly considered and dispassionately debated. Please help us advance the conversation by letting us – and them – know what you think. Now that a Charlevoix County ordinance permits ORV operation on most Beaver Island County Roads, we understand you are being asked to exercise your authority to adopt a township ordinance closing some or all roads in the township to operation of ORVs otherwise permitted by the county. As you may recall, our Board of Directors last August opposed adoption of a potential township ordinance that would permit ORV operation on township roads. We have carefully reconsidered our position in light of current circumstances, however, and now believe it would be premature for the Township Board to adopt an ordinance closing the roads to ORV operation at this time. We still question the wisdom of ORV operation on all county roads in Peaine Township, for two reasons: safety issues, especially on the dustiest, narrowest and curviest roads; and the risk of too-easy access to areas such as beaches, dunes and forests where ORV use is illegal and threatens the environment. But we think the speculation that Beaver Island will be overrun by hordes of ORV riders if a closing ordinance is not passed immediately is unlikely to prove accurate. We also know, and appreciate, that some Beaver Island residents operate ORVs on county roads responsibly and for legitimate reasons, and there is no good reason that should not continue. Therefore we believe the best course of action is to wait and see what happens in the next few months before deciding whether a complete or partial closing of township roads to ORV operation is necessary or appropriate. 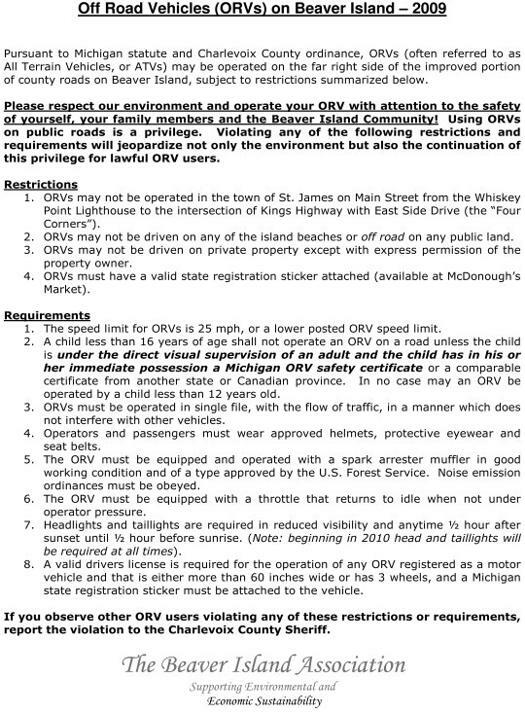 In the meantime, we will be asking our members for their opinions on this important topic and will attempt to get an information sheet on ORV operation on Beaver Island (see attachment) to all visiting ORV users by distribution through the Boat Company and posting at various locations. We also will urge all our members to be vigilant for violations of the statute and ordinance permitting on-road use as well as unlawful use on beaches, dunes, and other private and public lands and report all such violations to the Deputy Sheriff, and we will work with the Deputy to encourage prosecution of violators and to collect, analyze and publicize reports of violations. We hope the Township Board will join us in these actions. User Confusion: Current State law still limits ORV operation on State land to only those trails posted open to that use. In the forest, it is nearly impossible for riders to tell the difference between seasonal county roads and State forest roads. As the Motorized Trails Program Analyst for the Eastern Lower Peninsula and a representative of Forest, Mineral and Fire Management Division (FMFM), I encourage the development of designated (signed) routes between local communities that provide access to services, fuel, food, lodging and the State designated ORV system. Having signed routes provides clarity for the recreational trail users as to where they may safely and legally ride their recreational vehicle, particularly for those who are visitors from outside of your county. Environment: State land ownership in Charlevoix County is limited and the majority of that property includes environmentally sensitive wetlands, erosive ridges and culturally significant areas. Not all public property is well suited to wheeled motorized traffic and as lead State land management agency, FMFM is tasked with managing the State forest for a multitude of uses: from campers, hikers, bird watchers and berry pickers to hunters, fishers, snowmobile and ORV riders. Timber, fire and wildlife habitat management are also key to our mission. Opening county roads adjacent to and through State land to ORVs allows legal access to otherwise illegal areas of operation. This action in other counties has contributed to the development of illegal trails on State forest land, private property trespass and significant degradation of the natural resource. Enforcement: Just like any law, an officer has to catch the individual committing the illegal behavior to charge them with the crime, and only then can you take advantage of the increased monetary penalties set forth in the law. DNR Law Enforcement Division and Michigan State Police generally do not enforce local ordinances. Your Sheriff’s Department along with city and township law enforcement personnel will have sole responsibility of enforcing this ordinance. Please consider if those local law enforcement agencies have adequate resources to keep the ORV riders where they can legally operate. Riders seeking a safer more comfortable place to ride will move off of the county roads and into ditchlines, resulting in damage to the engineered road drainage system and increase the incidence of recreational trespass on private and public property. In most counties where I’ve had the opportunity to discuss this topic, I have observed the very vocal ORV riding proponents attending the meetings. I ask that you please also consider your silent constituents who may or may not be opposed to this use of the county’s roads and seek out the input of those who may not realize what is happening before its too late. Those are the folks that you will be hearing from later when there are an increased number of trespass, dust, noise and illegal operation complaints on and near the roadways. In closing, I encourage you to examine the proposed road opening issue very carefully. To that end, I offer my assistance in serving as a resource for you regarding the ORV Trail Improvement Fund Grants, the State’s designated system and helping develop an ORV plan that will incorporate the wishes of ORV users while minimizing risks to public and private lands. Feel free to contact me at the Gaylord Operations Service Center, 1732 W. M-32, Gaylord, MI 49735 if I can be of any additional assistance.